SOUTHFIELD — Lawrence Technological University and the City of Southfield have entered into a formal partnership to launch the Centrepolis Accelerator. Housed on the campus of LTU, the Centrepolis Accelerator will broaden and replace the small business and entrepreneurial support services provided by the LTU Collaboratory in recent years, leveraging the city’s focus on driving local and regional economic development through Southfield’s Centrepolis SmartZone. The Centrepolis Accelerator’s mission is to accelerate the growth of small manufacturers and hardware entrepreneurs by providing access to key resources. The accelerator’s website address is www.centrepolisaccelerator.com. The home page is pictured above. As part of the LTU-Southfield partnership, the Centrepolis Accelerator plans to open a new, state-of-the-art, 6,300-square-foot center in 2019 on the campus of LTU that will provide clients and partners access to office space, co-working space, workshops, mentors, technical and business services, a digital design lab, a mixed reality lab, a product prototyping lab, and other resources. Leading the Centrepolis Accelerator is Dan Radomski, who was recently hired as a result of the LTU-Southfield partnership. 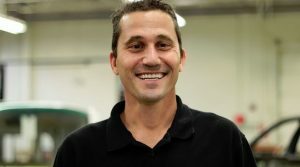 Radomski has an extensive background in manufacturing and supporting hardware companies, and is well-known within Michigan’s entrepreneurial ecosystem. He was most recently chief strategy officer for Optimal Inc. in Plymouth, and formerly vice president at NextEnergy in Detroit, the state of Michigan’s advanced energy industry accelerator. In addition to the City of Southfield and LTU, the Centrepolis Accelerator receives grant support from the Michigan Economic Development Corporation and the New Economy Initiative. The Southfield Centrepolis SmartZone inspires business growth. It is a place where designers, manufacturers, engineers and tech experts can grow their business ideas and learn how to take them to market. Its mission is to bring together universities, industries, research organizations, businesses, government organizations and community institutions to stimulate the growth of technology-based businesses and jobs. More at www.southfieldcentrepolis.com.